← Berkeley… Here We Go Again! Inagua Sharpie Update…Liberal Education Works? Well, the Inagua is coming along slowly. We (i.e. 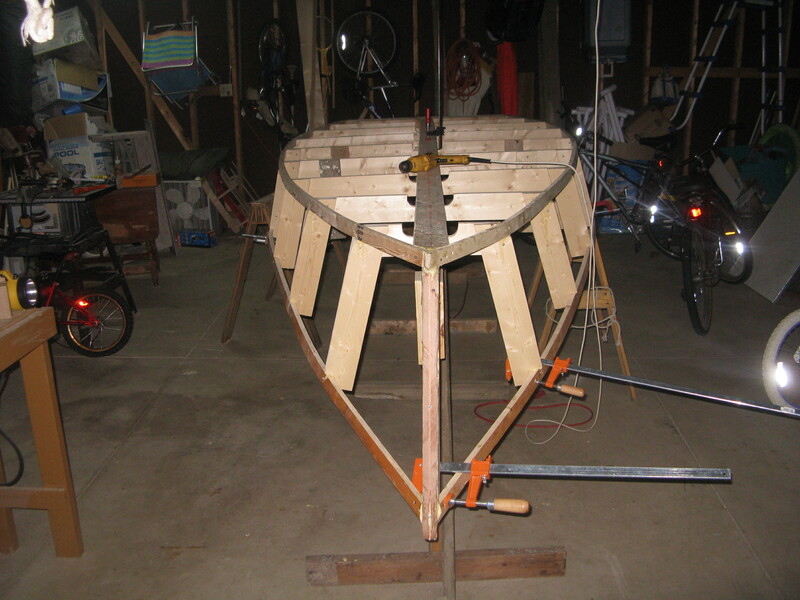 my son and I) were hoping to have it done already but that just goes to show how little we (well I should say “I”) know about all those little details that go into sailboat fabrication. I suppose a liberally educated person would have thought this all through in advance. But let’s not forget that even Aristotle mentions that the man of practical experience has a wisdom that can’t just be obtained from thinking! Right up front in his Metaphysics…the very culmination of his works…he praises men of experience! Maybe someday we will have both the theory and experience. At this point I would say that we are still struggling even with the theory of boat building. I mean we don’t even have the spars and rigging yet! We don’t have the centerboard…We don’t have pintels… We don’t have the sails! I need to sand this down and clean it up. Note the recycled lumber. The key is to try to keep those graceful lines. But wood has a peculiar way of snapping when one tries to bend it too quickly! Here is the stem of the Inagua. Its beginning to look like a boat! 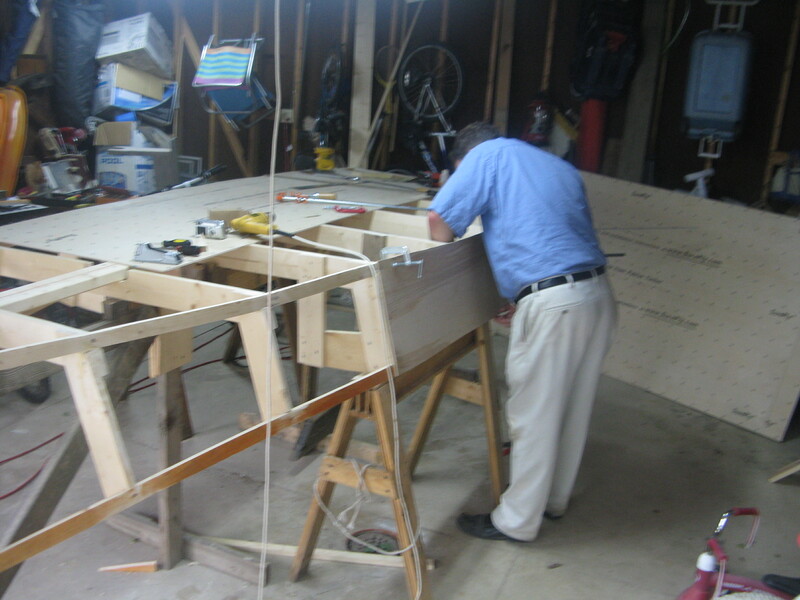 Now I am attaching the plywood to the bottom. You will be happy to know that it is 1/2″ ply. Thankfully the bottom of this boat is FLAT! 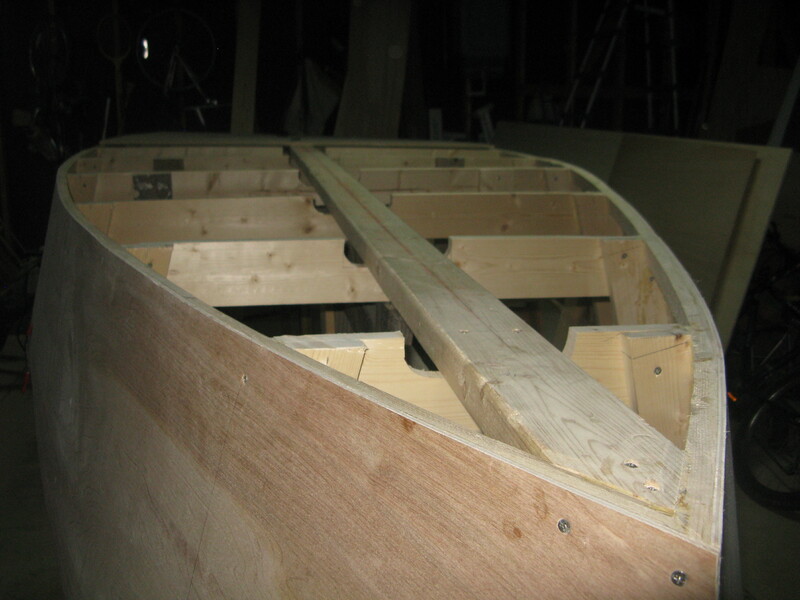 After we finish attaching the plywood to the bottom we need to do a little fiber glassing- of the seams especially. This entry was posted in classical education, liberal education works, Metaphysics and tagged Aristotle, INagua Sharpie, Liberal education at Work, Metaphysics, Sailboat. Bookmark the permalink. 2 Responses to Inagua Sharpie Update…Liberal Education Works? Masterful! Her lines are graceful. Thanks for the update! Steady as she goes…for I am certain the son grows in gratitude for his father who provides not only the liberal education but the personal experience as well. Happy Fathers’ Day, Mr. Langley! God bless you, Stephanie, and your children! Thanks! Hopefully the Inagua will be finished before summer is over. Otherwise my son is going to begin wondering whether buying a sail boat on Craigslist for $400 might have been a better plan. Actually I have not found one for $400 yet….but if I do I am going to feel slightly depressed. The other problem is that I have to figure out how to make a boat trailer now!